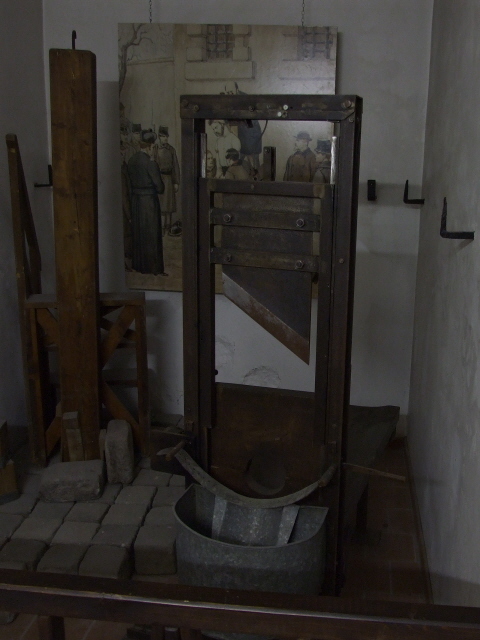 A small but in parts quite graphic and gruesome museum in Vienna – on crime in general, but brutal murder in particular. Absolutely not for the faint-hearted! 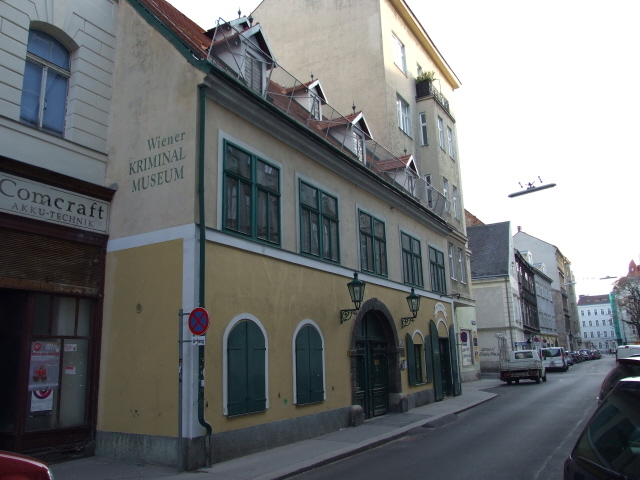 What there is to see: First things first: the Viennese crime museum ("Wiener Kriminalmuseum" in German) should really be an adults-only museum (you'll see why), and even adults should best come mentally prepared for some real shockingly gruesome exhibits and images! UPDATE 10 July 2018: I've just been back to this place and there have been a few small changes that I will soon work into the text below. The main thing is that there are now a few translations into English, and more are apparently in the making. Some exhibits have been moved to the museum's other branch outside Vienna (which I will have to go and check out soon before too long! 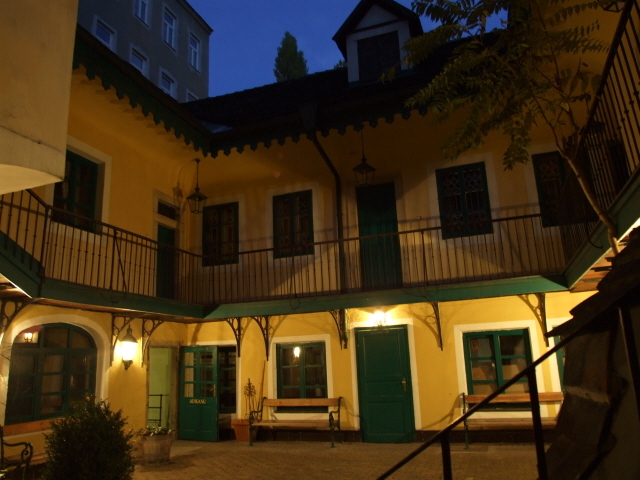 ), but overall the character of this little gem of a museum in Vienna is still the same. Note that all text panels and labels inside are in German only, so if you can't read German make sure you pick up the "Short Guide" in English at the museum shop before you enter the exhibition proper – the guide is not actually that short (sixteen A4 pages) and is absolutely essential if you want to understand a bit of the background of what you are about to see. The first section goes back to rather ancient times (late Middle Ages) and is not so graphic; but as soon as you've proceeded through the first narrow corridor beyond you suddenly find yourself eye to eye, literally, with the first shocker: the mummified head of an executed criminal (from the second half of the 18th century). 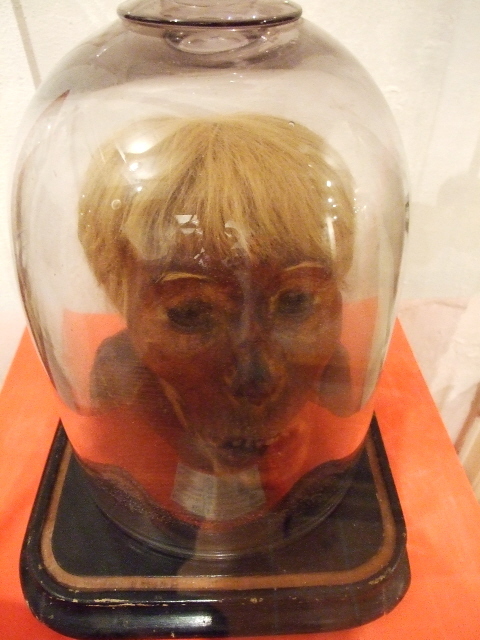 Apart from being an in-your-face gruesome exhibit, it's also interesting as the natural mummification left the blonde hair intact, which is rare. 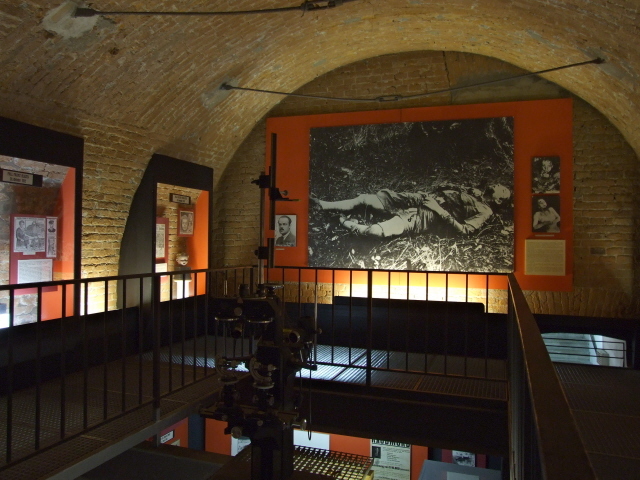 In the various rooms that follow you also get to see more heads, some just skulls, some with bullet holes, or pieces of a murder weapon (knife) still embedded in the bone, or dissected after execution (for "forensic", or rather: eugenic examination). A few death masks and preserved body parts (including bits of women's breasts' skin!) complement the drastically real theme. Other graphic shockers are oversized blown-up photos of hacked-up murder victims and other sinister stuff of a similar scale. All in all, the museum is as drastic as it is strangely captivating. It may feel a little dated, as the core of its contents does indeed go back a long time, even though the rooms have undergone some modernization too. But it certainly remains rather "quaint". There are too many individual cases, exhibits, stories to recount them all here, so this more general overview will have to suffice. In fact even when visiting the museum in person you can get a bit lost in all those stories and details. It's also easy to get lost rather literally in the maze of corridors and stairwells (most of the museum's rooms are in the basement) … I certainly lost my bearings a couple of times. But eventually you will re-emerge up the steps into the building's courtyard. Opposite a door leads you back to the foyer and the museum shop, which primarily sells a range of books but also a few postcards. Overall I can only recommend this bizarrely drastic and unusual museum – but be warned: it's not for everybody. For the dedicated dark tourist in Vienna, however, it's almost a must, even though it's so much less well known than some of the city's star attractions of a dark nature (such as the Imperial Crypt or the Central Cemetery). Not least because of its many graphic displays of death, it genuinely deserves the highest darkometer rating of any site within Vienna. Location: at No. 24, Große Sperlgasse in Vienna's 2nd district, less than a mile north of the heart of the Inner City. Access and costs: a bit hidden, but not difficult to reach; adequately priced. 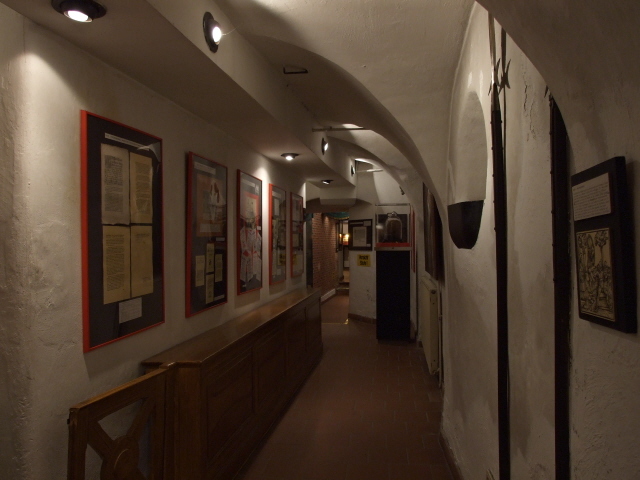 Details: to find the museum, called "Kriminalmuseum" in German, either walk down from the metro (U-Bahn) stop Taborstraße (U2) or the tram stop (line 2) on the same street, along Kleine Pfarrgasse (which branches off from Obere Augartenstraße to the left, westwards) until you get to Große Sperlgasse; turn left and continue for a block and a half. The low, yellowish and beige-coloured building that the museum is housed in stands out – literally, by being a bit closer to the street, i.e. where the pavement narrows. You could also walk it all the way from the Inner City centre: cross the Danube canal and walk up Hollandgasse, which branches off north from Obere Donaustraße. Proceed past the Karmelitermarkt food market (the 5A bus also goes past here) and turn right into Haidgasse. Große Sperlgasse is the next street and you'll see the beige house with the crime museum on your left. Admission: 6 EUR (some concessions apply) – you might think this isn't cheap for a small museum … but inside it's not that small at all, and you get to see a lot, so the price is perfectly reasonable. Time required: Do not underestimate this specialized museum. 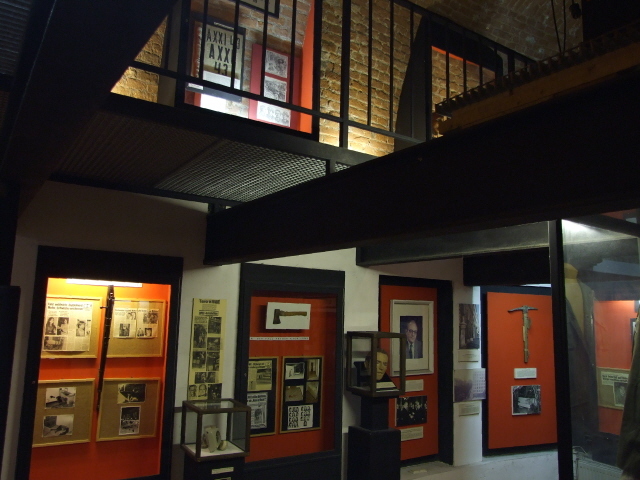 Its 20 rooms are chock-full of interesting exhibits and plenty of background information. If you can read German you could lose yourself in here for hours. Otherwise, plan about one hour for a decent (if that's the right word in this context) look around the more or less self-explanatory exhibits. Otherwise, the Inner City, Vienna's 1st district and old core, also has several dark sights, including the Michaelergruft, the catacombs under St. Stephen's Cathedral, and the Imperial Crypt. Combinations with non-dark destinations: the building the museum is housed in is one of the oldest in the district and as such worth a look from a point of view not related to the museum's contents. 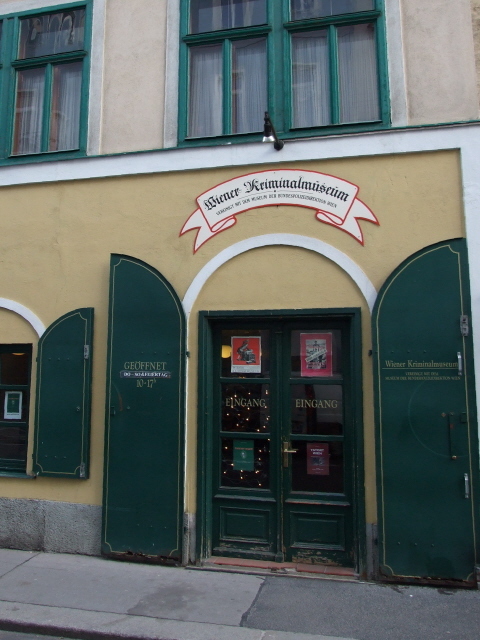 Vienna's 2nd district is quite interesting in general, as it is – again is on a smaller scale – Vienna's main Jewish district, as some of the shops and restaurants bear testimony to. Also in the 2nd district, but further north-east from the museum's location, is a prime tourist attraction that couldn't contrast more with the crime museum: the permanent funfair of the "Prater" (with its famous Ferris wheel – cf. also Third Man tours). In the other direction, it's not far to the old Inner City of Vienna, where most of the tourist action is.